Jason Aldean is no stranger to us. After what happened in the music festival in Las Vegas last year, more and more people are loving him. However, he decided to put that event in the rear mirror. Here he is now with a new album “Rearview Town” together with its success. But, before any of that, here are some facts about Jason Aldean. At the age of 15, the 41-year-old country artist started his career. Jason Aldean’s father was the one responsible of teaching him how to play the guitar. Also, his father was the booker of his show during his early start and he manage to land him gigs throughout Florida and some parts in the east coast. By the age of 21, he moved out to Nashville. During that time, he had recorded 8 demo songs and was pitching them to different record labels. However, his early deals collapsed before it yielded results. It took him five years of struggle before he became a country music superstar. “Rearview Town” is Jason Aldean’s eighth studio album that was released on April 13th of this year. Amazingly, on April 19th, the album already sold 183,000 units. Not only that, on the 28th of the same month, the album reached the summit of both Billboard 200 and Top Country Albums charts! Also, this album was the first country long play to top the Billboard 200 in 2018, now ain’t that amazin’? This new album tallies as his sixth leader on Top Country Albums. His fifth was “They Don’t Know” with 131,000 copies sold! Next in line is “Old Boots, New Dirt” selling 278,000 copies; “Night Train” with 409,000 copies sold. Then there’s, “Relentless” selling a whopping 982,000 copies! Last but not the least, “My Kinda Party” which debuted at No. 2 on November 20, 2010 and scored 193,000 copies. According to a country music blog, this album was again produced by Jason Aldean’s longtime collaborator, Michael Knox. “Rearview Town” has 15 songs with one duet with Miranda Lambert. In addition, few famous country artist co-wrote some of the song, like Florida Georgia Line and Morgan Wallen. “When you look at my career and the personal experiences I’ve gone through, it really seemed like a fitting title for this record, and it’s one of the best songs I’ve ever recorded. It was important to me to pick songs that have substance to them; I’m more conscious of that these days,” He added. In this album, we can say that Jason Aldean is still moving on from the tragedy he and his team experienced in the Las Vegas shooting that happened last year. He also said that it’s hard to keep going back to the memories and visions of that event. We’ve never seen this country artist’s vulnerability in his past albums. However, this album shows them all. Not only that, it also shows the heart of Jason Aldean. He also did share a story that may chill your bones. 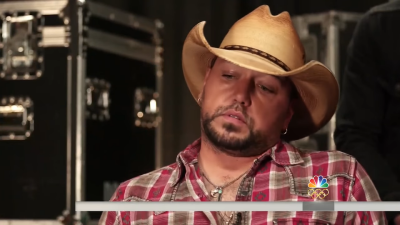 In an interview with SiriusXM, Aldean recalled the time when they found a bullet lodged in his bass player’s guitar. If not for the solid-bodied guitar, that bullet would’ve ripped into his guts. Luckily, no artist was amongst the 58 people killed on the 1st of October. Also, thank God, the band of Jason Aldean got off the stage safely. This guest post was submitted by Emily Aldridge over at CountryThangDaily.com so be sure to pop over and give her a visit! Country Music News Blog participates in advertising programs that help fund the operation of this site. For more information please visit our privacy statement. This entry was posted in Featured by Country Music News. Bookmark the permalink.